On this 9-night Botswana safari, guests will be taken on authentic exploratory adventures in the Okavango Delta, Chobe Enclave and the Khwai Concession. 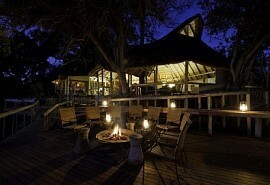 The focus of this safari is on the experience of the marshes of Botswana on foot and in traditional mokoros. Guests will have the opportunity to enjoy the diversity of wildlife from 4x4 safari vehicles as well as enjoying the details and the different perspective offered by the walking safaris and mokoro trips in the Delta. The first 2 nights will be spent doing just this at Footsteps Across the Delta, before moving on to Khwai Tented Camp for 3 nights, then to Footsteps Across the Linyanti for 2 nights, and finally to Linyanti Bush Camp for the last 2 nights. From US$5400 in Low Season to US$6600 in High Season per person sharing. 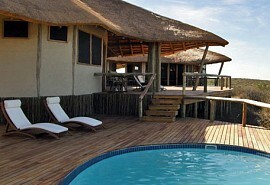 Footsteps is a very simple and rustic camp, currently located on the edge of a beautiful hippo-filled lagoon. The tents are set up in the shade of a lovely forested area and the camp takes a maximum of 6 visitors at once. 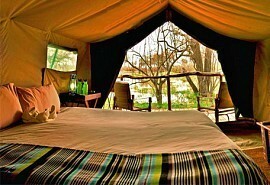 Although rustic camping, guests can enjoy the comfort of proper twin beds inside insect proof tents with sewn-in floors. After the morning's game activities at Footsteps Camp, guests will a game drive to the airstrip before boarding their light air charter, which will take them to Khwai airstrip. 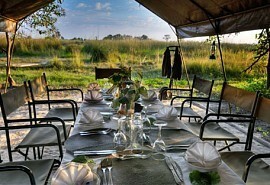 Khwai Tented Camp is located within the Khwai community concession, adjacent to the Moremi Game Reserve. 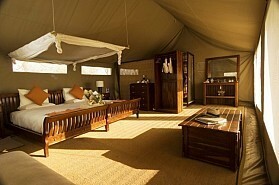 Khwai Tented Camp is an intimate, mobile, tented safari camp with only four tents. The camp is set up under a grove of fever-berry trees and each tent has a view over the Khwai River reed beds and Moremi Game Reserve beyond. The ensuite bathrooms are fitted with a flush toilet and a zip-up door leads through to the open-air bucket shower. This leg of the safari adventure brings guests in touch with the natural splendour the encompasses Botswana and is an unforgettable experience. This leg of the safari will bring guests back to the on-foot experience of Botswana. Distances walked each day will vary depending on the capabilities of the group and what their interests are. This is an adventure safari for those that seek to explore the wild and remote wilderness area on foot. Close-up, yet safe, encounters on foot with elephant, buffalo and lion are not uncommon, and guests will be in the hands of the best professional guides whose first passion is to interpret and bring to life every aspect of the bush. Accommodation while on a walking safari in Linyanti's Chobe Enclave consists of three Meru style tents with ensuite facilities and comfortable beds. These walk-in tents are spacious and can accommodate a total of 6 guests. After an early morning activity at Footsteps Across the Linyanti, guests will game drive through the Chobe Enclave to where they will spend the last 2 nights of their safari adventure. Linyanti Bush Camp is situated on the edge of the Linyanti Marshes in the Chobe Enclave, bordering the western boundary of Chobe National Park. It is an intimate 12-bedded tented camp, featuring large East African Meru-style tents and offering guests a choice of 1 double tent with a king-size bed or 5 twin tents with two twin beds in each tent. All tents have ensuite facilities with running hot showers and flush toilet, plus a comfortable sofa with a writing desk, chest of drawers and a cupboard. Each tent is strategically positioned to offer spectacular views of Linyanti Marsh. The marshes also offer the the opportunity to take part in a variety of activities, including game drives, nature walks, canoeing and fishing for tilapia.